a yummy dutch oven recipe. We ventured into the woods this weekend with our good friends for some last minute summer camping. We've been meaning to go all summer, but life just kept getting in the way. I'm so glad we made it though. Reese had the time of her life. She couldn't get enough of the unlimited rocks, dirt, sticks and water to play with and in. Here are a couple shots of her playing in the water. In my family camping is really all about the food, and it usually involves a lot of dutch oven food. We're best known for our dutch oven baked beans, but I've already been warned that if I ever post that recipe I'll be disowned. So dutch oven apple crisp will have to do. This recipe can also be easily adapted to the oven. Simple put all the ingredients into a 9x13 pan and bake at 350 degrees for about 45 minutes. I of course completely spaced taking a picture. But I did take a picture of my husband putting the coals on the dutch oven. This is pretty much what it looks like. Of course ours was served on paper plates, sans the ice cream. I borrowed this picture from closetcooking.blogspot.com. 1. In a buttered 12" Dutch oven add apples and lemon juice; stir to coat apples. 2. In a separate dish combine sugar, flour, cinnamon, nutmeg, cloves and salt; stir to mix. 3. Pour dry ingredients over apples and stir until apples are well coated. 4. Spread out apples and pour caramel sauce over the top. 5. In a medium bowl combine brown sugar, flour, oatmeal, and walnuts; stir to mix. 6. Using a fork mix in melted butter to form coarse crumbs. 7. Spread topping evenly over apples. 8. Cover Dutch oven and bake using 10-12 briquettes bottom and 16-18 briquettes top for 60 minutes. *The recipe above has been cut in half from the original recipe. I cut it in half because my family is smaller. Originally it serves 12-15 people. Feel free to double it, if you have a large group to feed. I made this today and it was AMAZING! 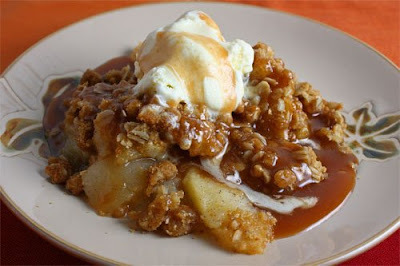 I will never make apple crisp any other way. The caramel makes this pure heaven. My family loved it. Thanks for sharing! If it's okay with you, I would love to post this recipe on my blog. I will of course give you all the credit.